One of music’s worst kept secrets is that fans seeking to get their fill of original music made in the classic R&B and soul style should include the continent of Europe and particularly the United Kingdom in their virtual or physical travels. Brits have a long, deep and abiding respect for the music, and they also have a deep bench of talented performers who have made their mark at home and on this side of the pond. That explains why plenty of American born R&B and soul singers perform in the UK or have set up shop there. The label Disco Soul Gold has brought a sample of these performers to a world-wide audience through compilations such as 2017’s Disco Soul Gold: The Nigel Lowis Mixes and this year’s The UK Soul Chart Album. The UK Soul Chart Album makes it clear that many vocalists born here in the good old U.S. of A. ventured to the UK because they found the environment for soul and R&B music more inviting than it is back home. Woodson is one of several vocalists who will be familiar to American based listeners. The compilation includes tracks by K. Avett, Lina, Darien Dean and L. Young. Others such as Miracle Thomas, Regina Troupe and Tyra Levone may not be as familiar, but they are among the performers who made solid contributions to this compilation. Levone’s “Can’t Love You More,” is a throwback to tunes where a gospel infused rhythm section provides the foundation for strings, brass and a song that tells the story of a woman who realizes that that loving someone else more than she loves herself is an exchange that she can no longer make. The percussion that opens Troupe’s “Friday Night” had me thinking that I was about hear a remake of “Outstanding.” What followed was an homage to 80s funk complete with handclaps on the mid-tempo steppers cut “Friday Night” – a track that follows a group of girlfriends having fun and perhaps finding love at the start of the weekend. Soutrackers might remember Ronnie Wright from the excellent compilation of Portland based soul singers, Bespeak Love. The brassy, mid-tempo funk of Wright’s “For Always” is another track that will bring the steppers set to the floor. I’ll leave it up to you to determine what it says about radio or the industry in general when quality tracks such as K. Avett’s “The Matter” or Dean’s mid-tempo fusion of funk and neo-soul “Hard 2 Put Words 2 It,” or the lush “Best Friend” by Regi Myrix feat. Lina can’t crack through. It can’t be good. 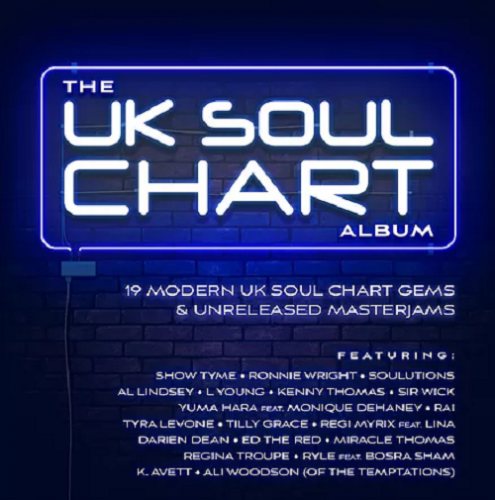 Thankfully, The UK Soul Chart Album will pique the interest of the uninitiated while also reminding SoulTrackers and other indie soul fans why we constantly remain on the hunt for quality music – a search that is consistently rewarded. Highly Recommended.